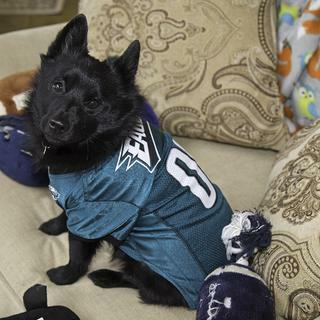 Your dog will be part of the action with the officially licensed Philadelphia Eagles Jersey. Made from 100% Polyester, the front of the jersey features a v-neck design with screen printed team logo and NFL shield logo. The back has the screen printed team logo, numbers, contrast stitching and woven jock tag. The material is sturdy and well made and it is fairly easy to get on. The sizes are odd though. My dog weights16 pounds and the large is almost too small. But it looks cute on him and the EAGLES are Super Bowl champs!